1) Only add tools, medications and other things you actually know how to use. While Subcutaneous Fluids look fancy and professional in a kit, it is useless, if you do not know how to actually use it. 2) The best kit will not help you much, if you do not know if your dog is sick or can’t diagnose what is wrong. In order to know that there is something going on with your dog, you need to know your dog. Over a course of a couple of weeks, take your dog’s vital signs every second day: temperature, heartbeat, mucus membrane color and capillary refill time. Check eyes and ears, so that you become familiar with your dog and your dog gets used to a quick health check. Write down the values on a piece of paper. For temperature and heartbeat, repeat the check after exercise and about 10 minutes after exercise to see, how much the levels rise and how fast they go down again. Knowing your dog’s regular body temperature, which can be between 100 and 103 degrees Fahrenheit, depending on breed and individual dog, can help you to quickly diagnose hyperthermia (heat distress and heat stroke) – or hypothermia (core body temperature too cold) and treat it fast. This alone can save your dog’s life! Calculate the average levels of your dog’s vital signs and write them on a piece of paper, which you will keep in your kit. It’s easy to have it laminated at a store like Kinko’s. 3) If your dog has certain conditions, like allergies, seizures, etc., make sure, you have a supply of their medication in your kit. Ask your vet to prescribe you an extra amount, so you can store it in the first aid kit. Diphenhydramine (Benadryl) – 0.5 to 2mg per pound, every 8 – 12 hours, relieves allergy symptoms. If your dog suffers severe allergies (e.g. bee sting), this will NOT save your dog, but may give you additional time until you are at an emergency clinic. Hydrogen Peroxide – one teaspoon per 10 pounds induces vomiting. Do NOT induce vomiting if your dog is losing consciousness or has ingested anything, that could hurt your dog when coming up (sharp objects, chemicals, etc.). Do NOT use Hydrogen Peroxide for anything else. It has been used for washing wounds in the past, but has now been proven to be ineffective. Instead use an antibacterial spray or cream. Antibacterial wash, spray or cream – do not use a ‘triple antibiotic’ such as Neosporin. Although many dog owners, even veterinaries, recommend it, they can actually be poisonous to dogs. Safe antiseptics to use for dogs are for example Betagen or simply Betadine. Alcohol Pads – can help disinfect a small area, but is also poisonous to the dog when ingested. Digital Thermometer – non-digital thermometers contain mercury and can harm you and your dog, if they break. Digital Thermometers are safer and usually faster. Tweezers – can be used for ticks or small objects sticking in your dog (e.g. piece of glass in the paws). Do not pull out any bigger objects or objects which are deeply imbedded. Instead secure these objects with gauze or bandages around it and go to the emergency clinic as quickly as possible. White, clean towel – if I suspect my dog having a wound, but I can’t find anything, I can wipe him or her down with a white towel, to find any possible bleeding fast. Muzzle – a dog in pain will bite. It does not matter, if it is your own sweet dog or not. Do NOT muzzle your dog if you induced vomiting, if your dog is losing consciousness, if your dog is in heat distress or has difficulties breathing. Wire cutter – if the dog in distress has a choke chain and the head swells (e.g. due to allergies), the only way to get the collar off, might be the wire cutter. Syringe/Pipette – makes it easier for your dog to swallow Hydrogen Peroxide or other medication. Activated Charcoal – can help with a poisoned dog. Always go to the emergency clinic as fast as you can or call the Poison Center if you suspect poisoning. Styptic Powder – can stop bleeding fast. Only used on small wounds. Honey – is an antibacterial substance that can seal a clean small wound and prevent infection. Instant Cold Wrap – can numb a painful area and cool down a dog. To cool down a dog in heat distress, do not place cold wrap directly on the fur. Use a towel or bandages and apply between the legs, ears or stomach area. Do not restrict the dog’s mouth or nose. Check your kit regularly and have an inventory list. This helps you in case of emergency to keep track of what you have and where you have it. Check for expiration dates and replace old products. Take a First Aid class and keep current – you can also keep notes on how to perform K9 CPR, etc. in your kit. Keep a kit in your car, if you frequently travel with your dog and check with your veterinary for more ideas on what items could be life saving. 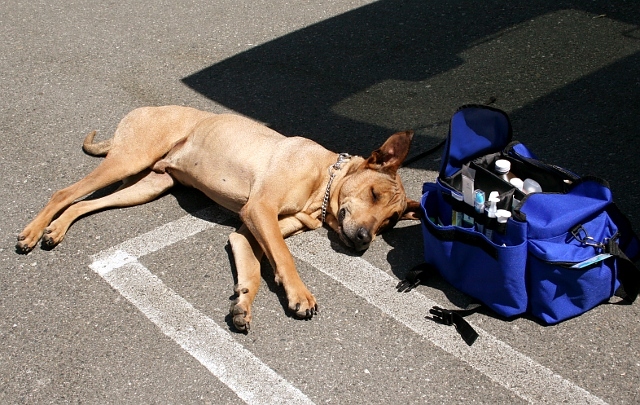 A K9 First Aid kit is just that: First Aid. Always check with your veterinary or when in doubt, go to an emergency clinic right away. Cuts, abrasions and bruises in your dog’s face may need veterinary checks because of their vicinity of the eyes. 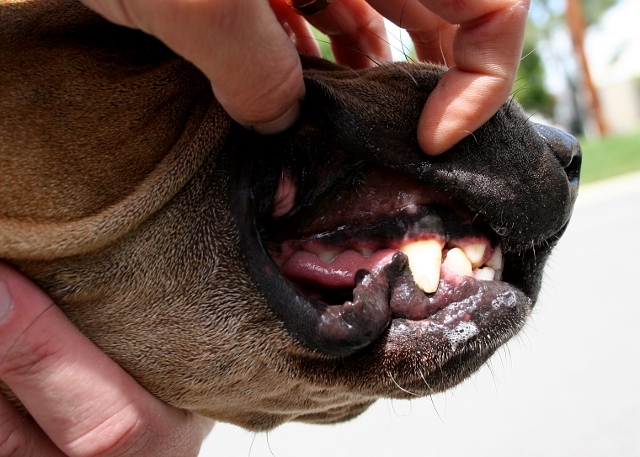 Dog bites can leave small but very deep wounds and need to be cleaned very thoroughly. Always keep a close eye to wounds and abrasions, if they do not appear to heal, if the area gets more sensitive or seems swollen, go to a veterinary or emergency clinic. The number of the Animal Poison Control Center is: 888-4ANI-HELP (888-426-4435) – there is usually a fee for the call.